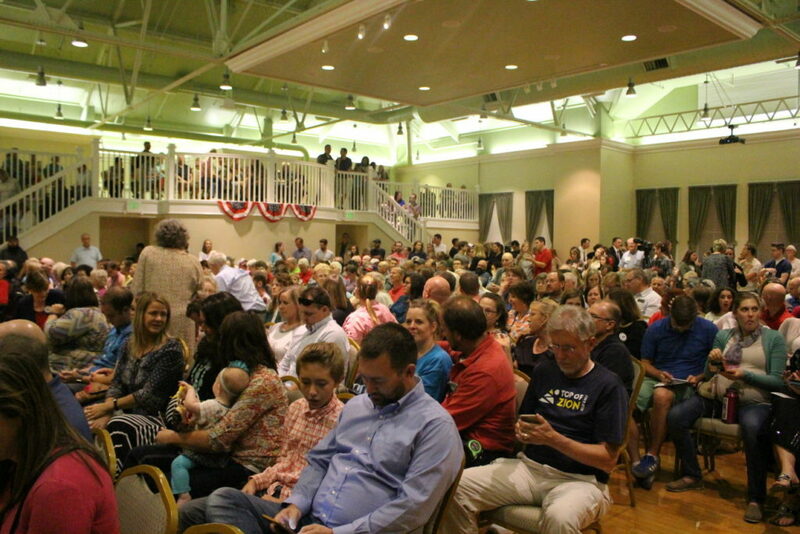 ST. GEORGE – There was standing room only as the top floor of the Dixie Academy building in St. George became packed with people who came to hear independent presidential candidate Evan McMullin Saturday evening. The former CIA operative and congressional staffer jumped into the race in early August as an alternative to Trump. Yet no one else would, he said, so he did. McMullin had been looking for a Trump alternative with the group “Better for America,” but it was to no avail. With time slipping away, McMullin eventually made the decision to himself be the candidate for whom he had been searching. 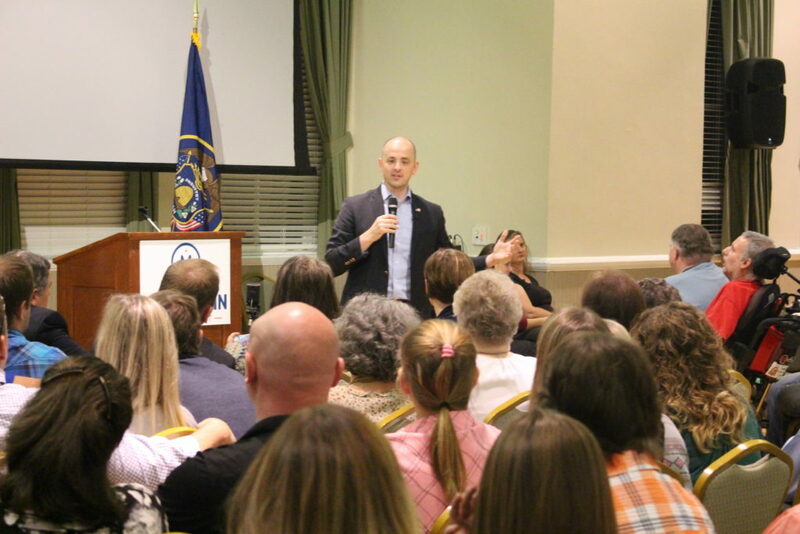 Prior to launching his campaign, McMullin worked as the chief policy director for the House Republican Conference. 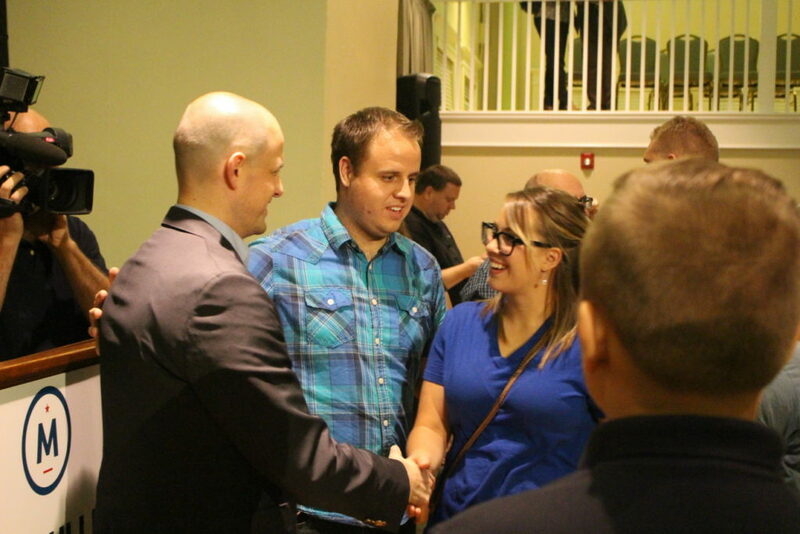 McMullin is also a graduate of Brigham Young University and a member of The Church of Jesus Christ of Latter-day Saints. 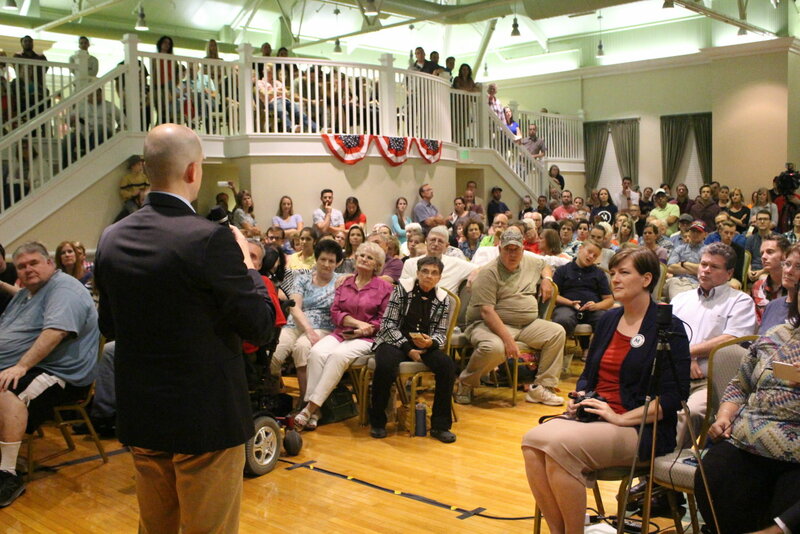 During the packed town hall, McMullin touted himself as a principled candidate who supports states having more power of self-determination over ever-increasing federal overreach. As an example, he said individual states should have the ability to determine for themselves what type of health care system they have. 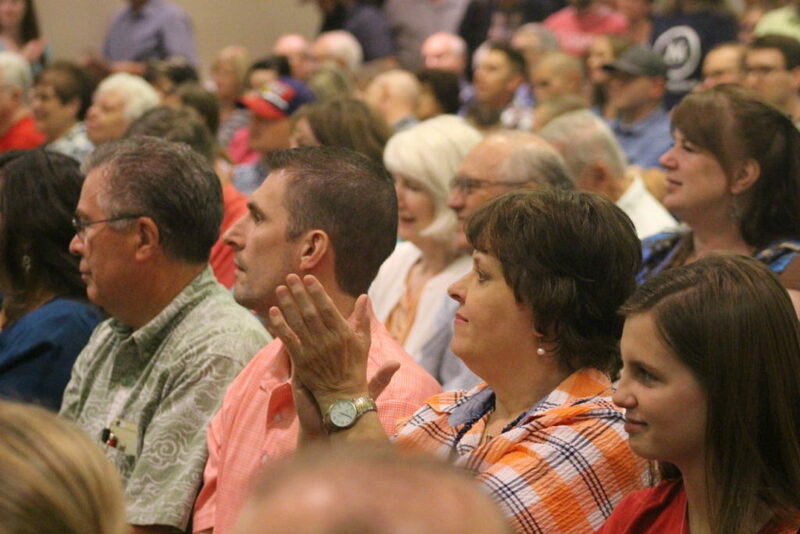 On public lands, McMullin favors the states having more control over those lands as well, saying that Utah and other states can manage their own lands better than bureaucrats 2,000 miles away. Like many others, Pike recently said his conscience would not allow him to vote for Trump. In an Oct. 8 Facebook post, the mayor said Trump should not be the next president and should step down. This came on the heels of the Oct. 7 release of an 11-year-old audio recording of Trump making crude remarks about women. Pike said he would not vote for Trump and would have to look at another candidate. McMullin may be his man. McMullin also called for a “new conservative movement” to help counter what he is calling a crisis of leadership in the country. “I am committed to advancing the cause of our fundamental principles in this nation,” he said. He also called on people to be more engaged in politics and to vote. 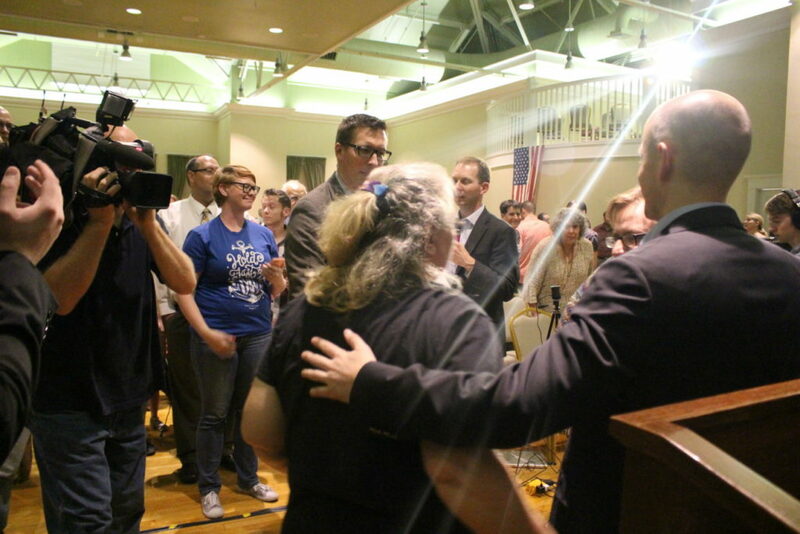 “Our votes are our voice in our process, in our system,” McMullin said, adding that if more people do not become involved, the nation will never have the kind of leaders it really needs. Above all else though, he told people to vote for their principles and their conscience. 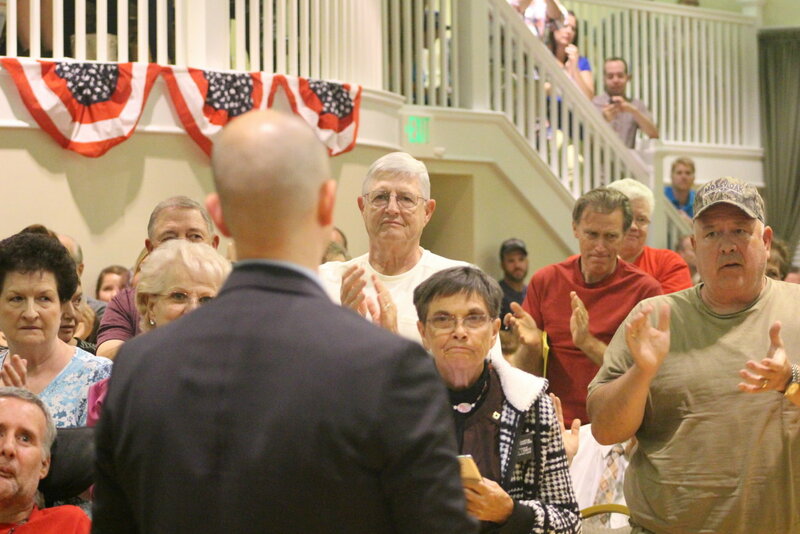 Those remarks earned McMullin a standing ovation. 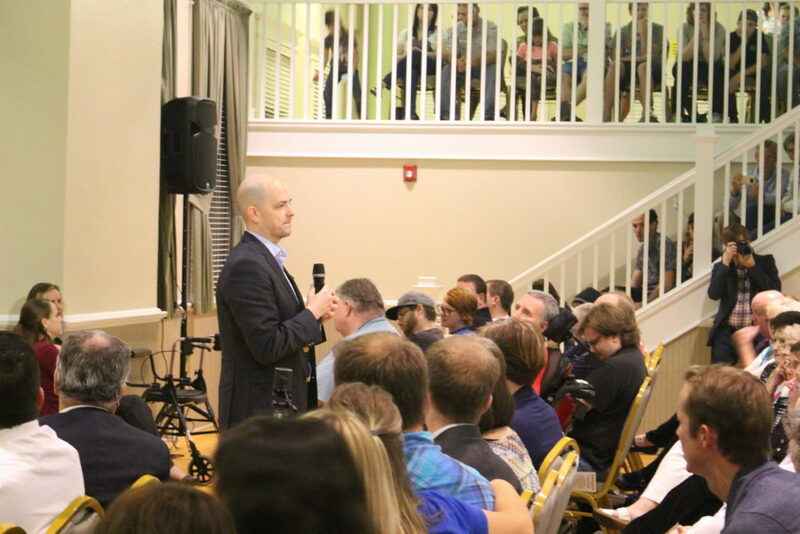 McMullin’s campaign is hoping people will vote on the principles the independent candidate espouses and is specifically targeting the Western states, which include Utah. The goal is to win one or more states in the West as a possible means of keeping either Trump or Clinton from gaining the 270 electoral votes they need to gain the White House. If such an upset happens, the vote will be thrown to the House of Representatives who will ultimately pick the next president from the three leading candidates. A recent article from news site FiveThirtyEight goes into detail about how this process could make McMullin’s long-shot bid for the White House a plausibility. 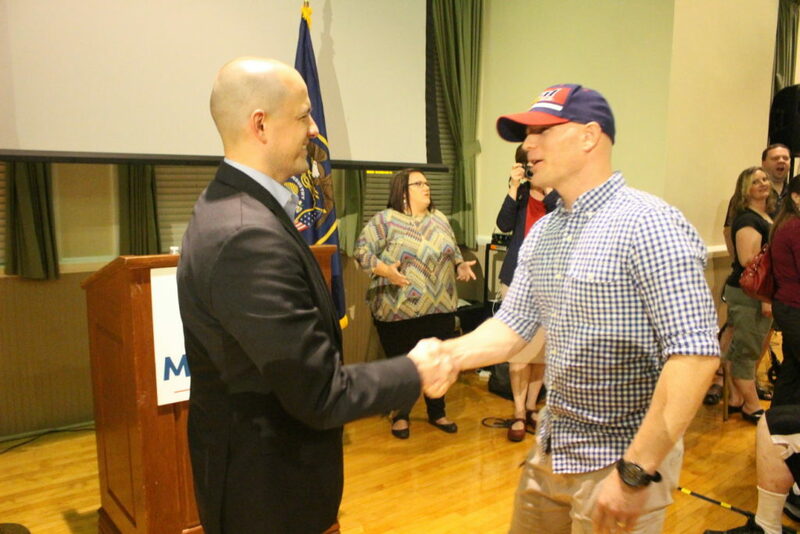 The campaign believes McMullin has the best chance in states like Utah, Idaho and Wyoming, as neither Trump nor Clinton won those states in the primaries earlier this year. McMullin’s campaign has enjoyed a surge in popularity and support over the past week, he said. Earlier this week, McMullin came in a near-tie with Trump and Clinton in a poll conducted by Y2 Analytics that was published in The Deseret News. Both Trump and Clinton were at 26 percent, with McMullin at 22 percent. The poll’s margin of error is plus or minus 4.4 percentage points. However, Trump is losing to Clinton, McMullin said. 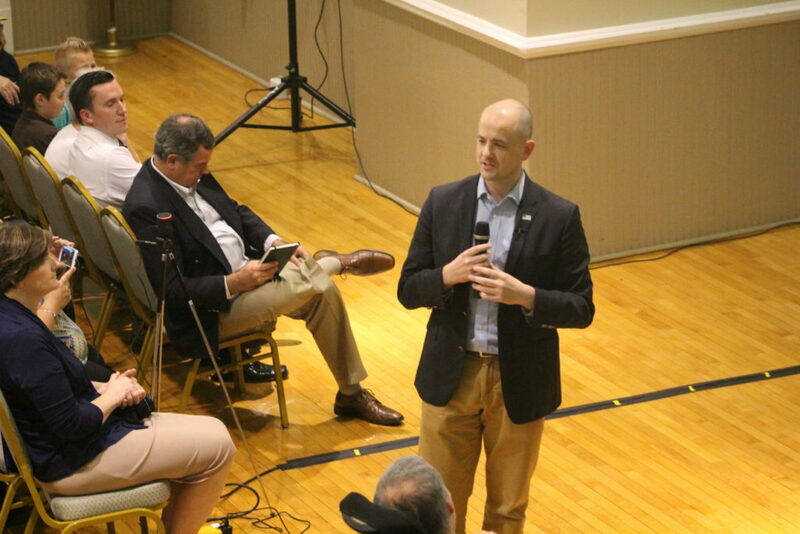 “The reality is Donald Trump is losing terribly to Hillary Clinton because he is a terrible candidate,” McMullin said to St. George News following the town hall meeting. 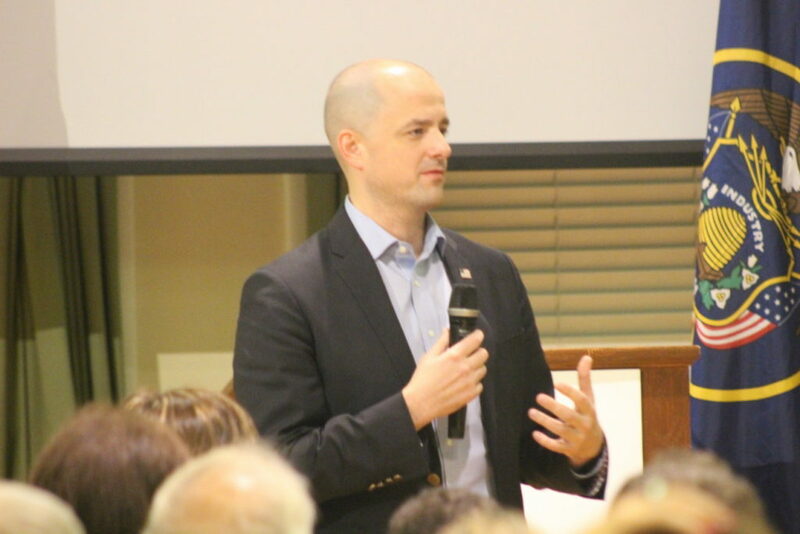 Concerning claims from detractors that McMullin will be a spoiler in the race and ultimately cause it to go Clinton’s way, he said he has a constitutional right to run for president, that he has chosen to exercise that right just like the other candidates. “I’m a candidate and I’m competing for victory here in Utah,” he said. As to notions that voters need to support Trump in order to get a conservative justice on the Supreme Court to finally replace the late Antonin Scalia, McMullin said they shouldn’t depend on Trump to do that. Once more, McMullin repeated that Trump is not a true conservative but rather a New York liberal like Hillary Clinton. He’s supported late-term abortions and a single-payer health care system, McMullin said. He also claims Trump was not a supporter of the Second Amendment until he started campaigning on the Republican ticket. 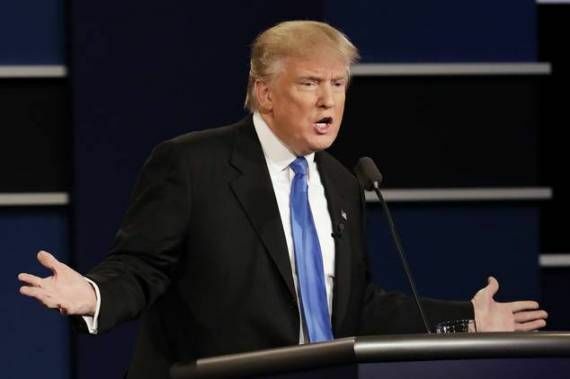 “Trump is a guy who switches positions on even the issue that are the most important to him every week,” McMullin said, and noted that Trump has said his sister, federal Judge Maryanne Trump Barry, a known liberal, would also make a good Supreme Court justice. Trump has offered the names of known conservatives as possible candidates for the Supreme Court as well. Among them is Utah Sen. Mike Lee. Still, McMullin is not convinced Trump would follow through with a conservative nominee if elected president. Prior to learning about McMullin, some town hall attendees said they might have voted for Trump simply because he wasn’t Clinton. Now they feel they have a viable alternative. 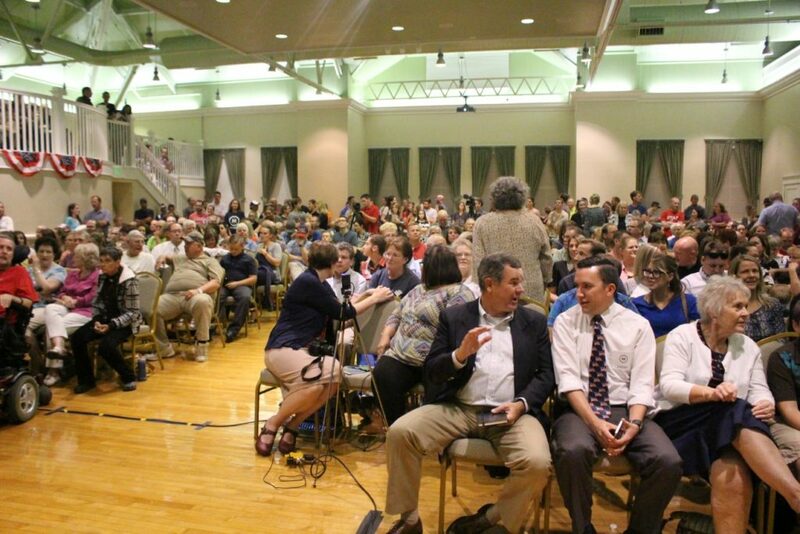 “He seems the right candidate to support,” attendee Joshua Jones said, adding that he had seen Trump as “the lesser of two evils,” an expression that is often used during election season. However, voting for a lesser evil still leaves you with something evil, McMullin said. He added that a theme of his campaign is “evil is still evil.” To support such candidates is to lower the standard of leadership for the country, he said. I didn’t leave the Republican party, it left me. You should go to facebook and listen to the whole speech, check him out and then do what you know is right. The FiveThirtyEight website puts the McMullin candidacy’s chances of winning the Presidency in proper perspective. – The referenced article “estimates about a 1.7 PERCENT CHANCE (my emphasis) of Trump’s winning 269-275 electoral votes”, then McMullin being able to win Utah’s 6 electoral votes. – 270 electoral votes are needed to win the Presidency. A key fact: almost of the U.S. states’ electoral votes are awarded as “winner take all”. So whether a candidate(s) loses a state’s popular vote by 0%-to-100%, or 49%-to-51%, or 24%-to-25%-to-25%-to-26%, the result is the same: all the losing candidates get 0 Electoral College votes from that particular state. – Over the past 200 years, in only ONE Presidential election (the 1824 election) did a candidate not win the required number of Electoral College votes. In the 1824 election, each of the four candidates actually WON three or more states. In this election, FiveThirtyEight shows McMullin polling at a statistical 0% in all the states outside Utah; it’s VERY unlikely that McMullin will actually win a single state outside Utah. – FiveThirtyEight’s current forecast: Hillary 339.7, Trump 199.0, Johnson 0.1, McMullin 0.1. Hillary is projected to easily exceed the required number of electoral votes. The impact even IF McMullin wins Utah is likely zero in preventing Hillary from becoming President. It will just decrease the total electoral vote count for Trump. Evan McMullin’s chances of winning the Presidency are statistically about the same as buying a winning mega-millions lottery ticket. I’m impressed with your commentary and sad, contemplating the forecast outcome of the election. Having Hildy, the beast, for a president is akin to having a transgendered Obama for another term. YUK! – Illegal Immigration. The rationale for McMullin’s “Earning Legal Status” is similar to the “Path to Citizenship”, which was the cornerstone of the Gang of Eight Senators that tried to pass an Illegal Immigration reform bill in 2013. Both plans make vague promises to improve border security, visa tracking, and employment verification (promises which previous Congresses have broken or never followed up). – Trade. 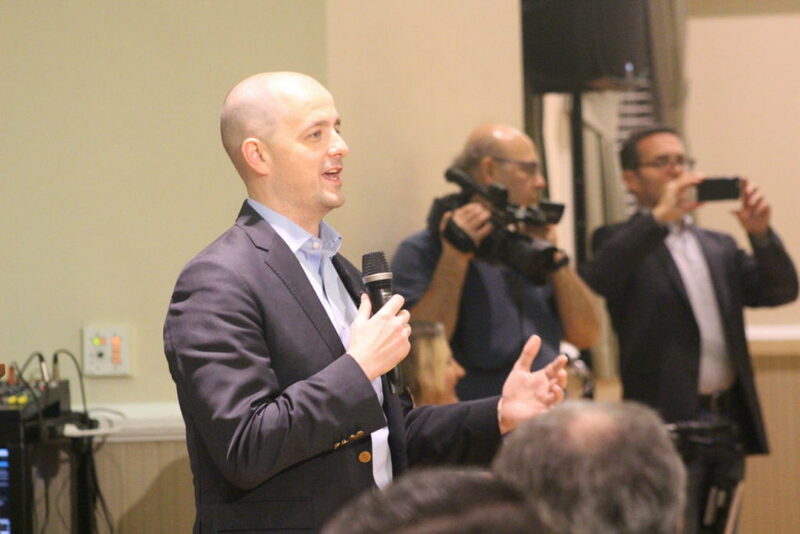 McMullin enthusiastically supports the proposed Trans-Pacific Partnership (TPP) and other trade agreements. Such agreements have put American companies at a competitive disadvantage, as U.S. jobs have migrated to lower-cost countries that mistreat their workers and pollute the environment. McMullin says that he agrees with Hillary Clinton’s assessment that TPP is the “gold standard” of trade agreements. – National Security. McMullin says that he will “pursue the defeat and destruction of the Islamic State” – then says nothing else about the topic. In September 2014, Barack Obama also said we “will degrade and ultimately destroy ISIL”; how’s this policy turning out? On these issues McMullin only differs in degree, not in kind, with the positions of Hillary Clinton. Do you want to support a candidate whose ultimate goal is to keep Donald Trump out of office, or one who wants keep both Trump and Clinton out? Gary Johnson is is in to win it, and deny both the 270 electoral college votes. He is with in striking distance, is on the ballot on all 50 states, and the only third party candidate with even a slim chance of winning. Carrying Utah, could be difference between denying Hillary and trump the necessary 270 votes. Gary Johnson’s greatest chance of winning a state is New Mexico (with 5 Electoral College votes), of which he is a former two-term governor. According to the FiveThirtyEight website, Johnson has “an outside chance – 2 or 3 percent – of winning the state”. Nationally, FiveThirtyEight projects the same total number of Electoral College votes for both Johnson and McMullin – 0.1 electoral votes each. Hillary is projected to exceed the number of electoral votes needed to win the Presidency by almost 70 votes. Johnson winning both New Mexico and Utah (a very remote chance) would still only give him 11 electoral votes total. Yes, as Not_So_Much urges you to go check out Mr Mcmullins facebook, all of it, and his twitter. Do your own investigating since this article implies Mr McMullin leapt off his couch in complete disgust at the current political candidates and became Citizen McMullin ‘the principled candidate’ because SOMEONE had to do it. In reality, Mr McMullin is the latest candidate of the Renegade Party or whatever they’re calling it now; a third-party independent (the first stooge was the reluctant David French who landed with a resounding thud) created by NeoCon Bill Kristol, Rick Wilson (vile) and the rest of the NeverTrumpers, designed to pull votes from Trump and help Hillary into the White House. Better for America is a Super pac of John Kingston, an ally of Mitt Romney, and funding Mr McMullin. How do we know Mr McMullin is the principled candidate? No one has heard of him, he’s not been vetted, all we know is his resume. Is he supposed to get our vote because he’s a Mormon and Romney lackey? Are we sheeple? He says he’s the true conservative, but a quick look at his views on immigration and trade (he’s for TPP). The truth is, Mr Trump is more conservative. I voted for Romney in 2012, I don’t understand his vitriole (along with the other Utah politicians) towards Trump. Had he shown that fight in him in 2012, things might have been different, otherwise, this is some personal vendetta and you look pathetic Mr. Romney, or is it simply that you are for open borders and TPP and therefore have more in common with Hillary? This election is sooo important. Please get informed and look at the motives behind those urging you to vote on ‘principle’ when you should be voting on the ISSUES!! Look past crude language and unproven accusations to keep you distracted from WIKILEAKS and the corruption and collusion between the MSM, Clinton campaign, and the highest level of this administration. If we get Hillary, get ready for higher taxes, Obamacare, more debt, more govt, a progressive Supreme Court, unfettered immigration that will change the voting landscape forever..oh and it won’t effect Mr Romney the way it will you and I…and your ‘conscience’ vote won’t save you then.